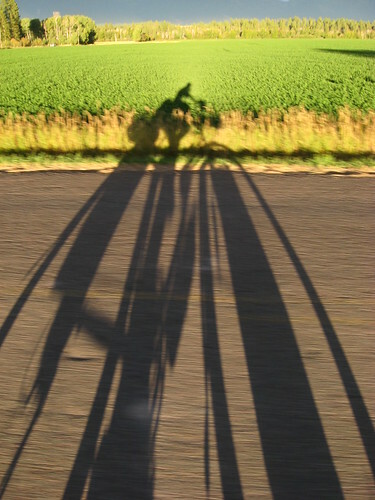 Adventure Cycling Association, an organization dedicated to promoting travel by bicycle, is holding their 2nd annual photography competition. When I passed through Missoula, Montana over a year ago I got to drop in on their offices and spent a little while talking to one of the founders, Greg Siple, which was great. 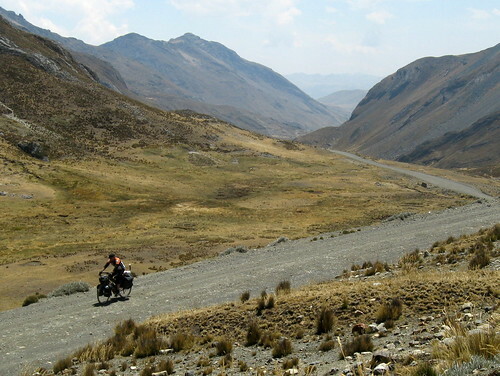 He biked from Alaska to Argentina almost 40 years ago, his must have been one hundred times the adventure my trip has been. I’d like your help picking out 5 entries to submit to the contest. The guidelines for their competition state: “We are looking for striking digital images that capture the spirit, wonder and adventure of bicycle touring and travel.” While I’ve come across some amazing scenery and settings, most of my pictures don’t include anything cycling related (I just happened to get there by bike), but after a year and a half on the road I have a few pictures that might be worth entering, mostly of other cyclists I’ve biked with at some point. Last year’s winners can be seen in here [PDF]. Here they are, in no particular order (actually, they are in reverse chronological order). I’ll submit them sometime next week, they are due by the end of December. Any input would be appreciated! Thanks much. 1. 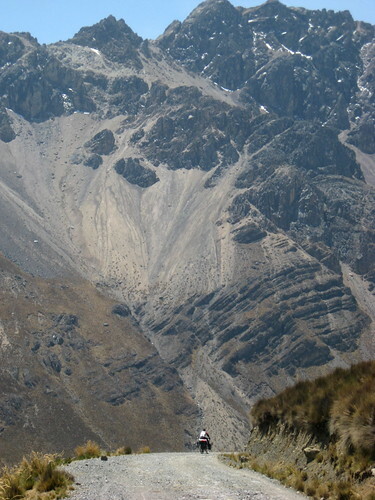 Greg approaching the 16,000 foot pass in Huascaran National Park, Peru. 5. 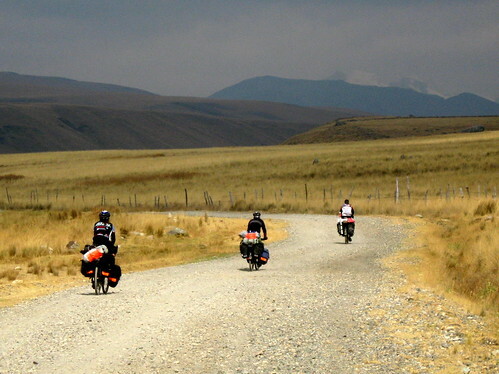 Cycling buddies Torrey, Lucie and Greg entering Huascaran National Park in Peru. 6. 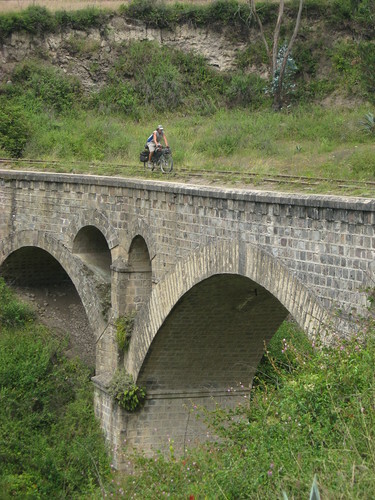 Dylan crossing an old railroad bridge. 7. 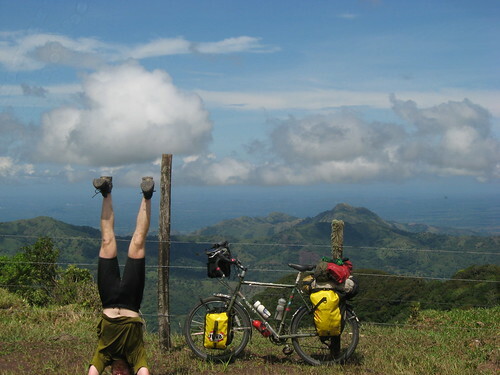 Not just any upsidedown picture, this one is of me just a few miles away from the Continental Divide at around 3,500 feet above sea level, with a view of the Pacific ocean, don’t know of anywhere else in the Americas that is possible except for narrow Panama. On the way down, got up to 50mph and lost my sunglasses. 8. Greg and Paul near Almirante, Panama. 9. 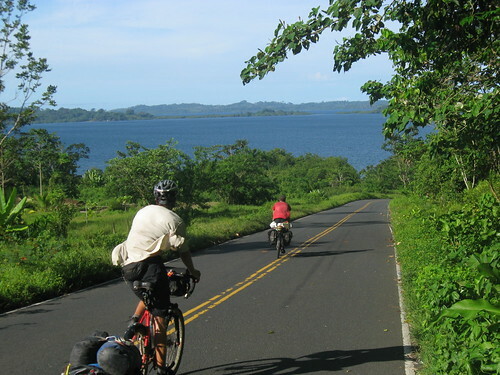 Just another day in sticky, sweaty Central America. 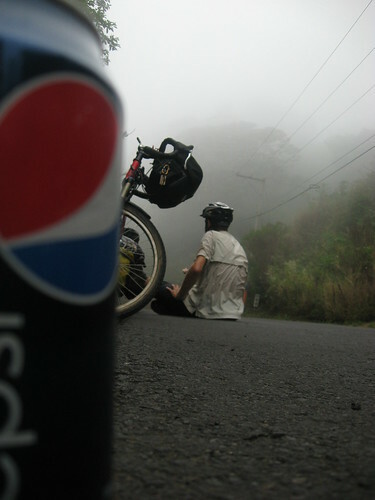 Paul and I take a break on the road. 11. Generally don’t think a slightly blurry shadow picture might have much appeal, but the light was amazing one afternoon in Montana. 12. 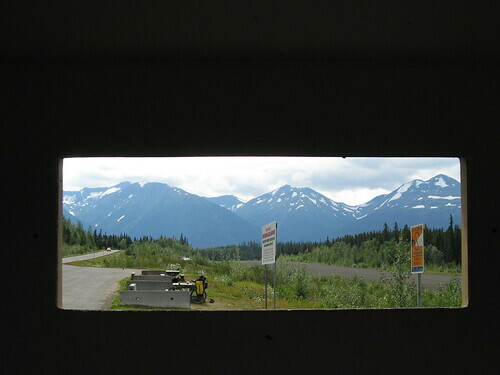 The best bathrooms on the trip… Canadian provincial outhouses. Generally pretty clean, and no plumbing to break. 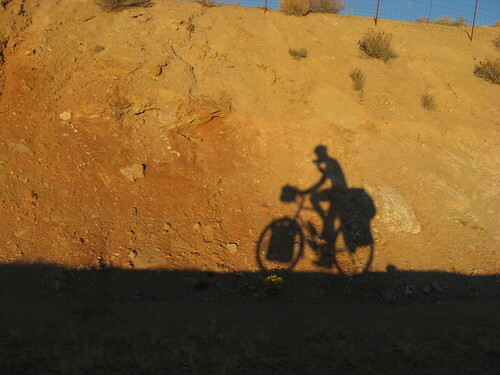 (Yes, you can see my bike so maybe it counts as a “bike touring” picture). 13. Alaska! I almost decapitated myself with the ax hanging in the antlers. I bumped it with my head and it fell, nearly missing me and the bike. 14. 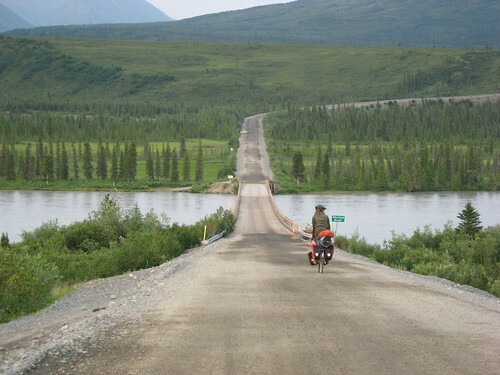 Baptiste crossing the Susitna river on the Denali Highway. We must be related! I was thinking the same. How’s the trip going? Where you at these days? Its going well! 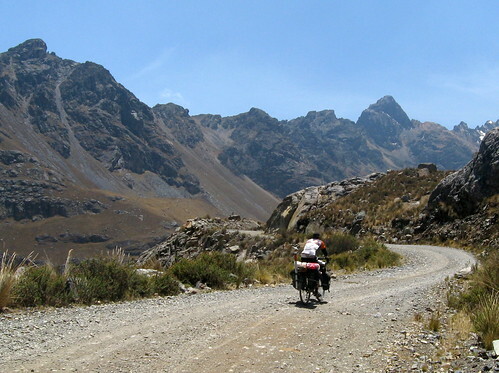 I took several weeks off the bike, I’m in Salta and am taking off tomorrow. So close, yet so far! 1 is a sweety (not just b/c its me!) 5 nice light (that was a beautiful evening)9 perfect image of central america (send it to pepsi while you are at it)and 11 get my vote. I love the first picture! 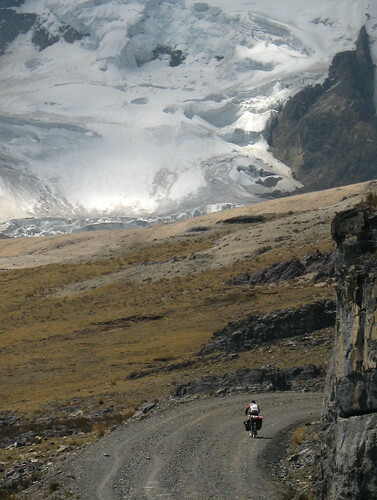 The cyclist in it is tiny, but the mountains of ice are mind-blowing. Also, 5, 7, and 14.
there can be no other option. Matt! This photos are amazing. Your trip is really inspiring. I like 1, 2, 7, and 14. 1, 2, 7, 11, 14. Great stuff. I vote for 1,3,5,10 and 14. Great photography. 1,5,9, 11 I love 1 its so striking with the glacier. And it has my brother in it. Geez i just realized I said the exact same photos as my brother. Merry Christmas and Happy New year! I hope you don’t have to spend New Years with my brother- thats dangerous. Hopefully I will get to meet you in Feb.
Hey Matt, Great shots! You’ve got to be a winner! I like 1, 3, 5, 6, 7, 11. I could also add 13 & 14, too. Feliz Navidad, Amigo! Merry Christmas Matt, these are GREAT–my vote 1,3,5,8,14–hard to decide, I accutally would submit 8 of them. Matt, since we are from Chicago we get to vote twice 1,3,6,10,14 (These are Krystyna’s choices) Good luck, nice job. hey, is this comment thing working? obviously 6 if it´s not too late to vote. 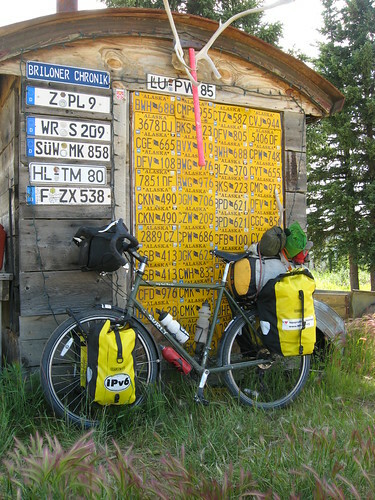 6 because that´s me and i love being in adventure cyclist mag (june ´10 feature, anyone?). but really, #1 by far. 1 is certainly exceptional but also 5, 9, 10, and 11. Hope you win, of course 1 has my son in it. You will soon be on the Austral with Greg.